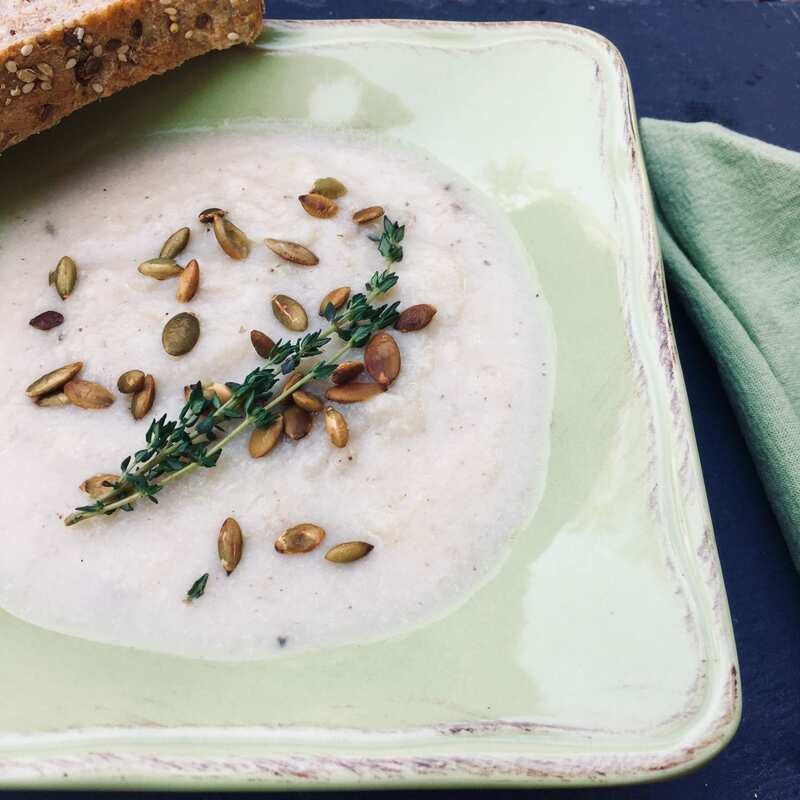 We call this magical cauliflower soup because none of my kids are huge cauliflower fans, yet they get deliriously happy when they eat it this soup – and cauliflower is the main ingredient! I love that it’s low in sugar and high in savoury yumminess, supporting my ‘celebratesavoury’ campaign. This soup is low in calories, and suitable for those on a lower carbohydrate diet. I recommend serving with a hearty salad (throw in some beans, nuts or seeds!) along with bakery-fresh multigrain bread to make a full meal. Play with the amount of cashew cream to suit your tastes (and low-versus-high calorie goals). You can also amp it up with one or more toppings, including croutons, roasted chickpeas, or pumpkin seeds. Soak 3/4 cup of cashews in 1 cup of boiling water. De-stem the cauliflower and break into florets. Preheat oven to 450 degrees F. Line a baking sheet with aluminum foil or parchment paper. Roast the cauliflower. Add the cauliflower florets to the baking sheet and 1 tablespoon olive oil, about ½ teaspoon salt and grind some pepper over it all. Using your hands, mixing it all in, massaging the ingredients into the cauliflower. Add the smashed garlic (skins still on) to the baking sheet. The skins help to prevent it burning; you’ll remove them afterwards. Roast for 15 minutes at 450 F.
Add the roasted cauliflower, the garlic (skins removed), 2 sprigs of thyme and vegetable broth. Mix together with spatula. While soup is cooking, prepare the cashew cream. Simply blend the cashews and water. Blend the soup well – it should be a puree. Can be done in the pot with hand-held immersion blender, or by pouring into a high-powered countertop blender (if so, cool first). Cashew cream can be added to pot all at once before serving or added to each dish. Pour into bowls and add your choice of toppings. Good options include crushed red peppers, extra thyme and / or extra cashew cream. Croutons or roasted chickpeas or pumpkin seeds would also work well to make this dish more filling and adding a bit of crunch. This recipe is adapted (only minor changes) from Jessica in the Kitchen.